Manroop Johal BBA MBA is currently the Director, Human Resources for Atira Women’s Resource Society, a non-profit organization aimed at ending violence against women and children. She supports over 300 staff in all aspects of Human Resources. 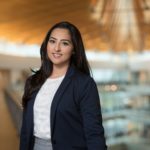 She is a recent MBA graduate from Beedie School of Business at Simon Fraser University and holds a BBA with a specialization in Human Resources from Kwantlen Polytechnic University. Manroop is passionate about and committed to ending violence against women, in particular in the Punjabi community, of which she is a member. She does this through continuous education and advocacy within her family and cultural community groups. She is also a change agent working towards continuous process improvement within organizations. She believes that employees are an organization’s biggest asset and an imperative piece of an organization culture is a healthy work environment.